Walker rest seat flips down when you need it and stays out of the way when not in use. Secures with hook-and-loop fasteners to most walkers; no tools required. Walker seat attachment is made of wipe-clean polyurethane over padded wood frame and supports up to 250 lbs. 25 1/4" L x 8 1/2" W x 3 1/4" H.
I have had mine for 2 years and love it so I purchased one for my Mom. She needed a seat on her walker so she could sit as she walked. Just perfect for both of us. I purchased this product for my 85 old mother who needs to rest every so often while walking. I would recommend this to people who need to use a walker but needs to "rest" every so often. No need to search out a chair, bench or anything for them. I can set my oxygen tank and purse on the set when we go out to it. Most place's we have to put are own food on the plate, so bought the tray for the top of the walker. Really helps me to get back to the table. Love it. A lot of these questions did not go with what I bought. The rest seat is very convenient and economical. It's the only one I've seen for a fold-up walker. I'm light weight, so it should last a long time for me. I go shopping with my daughter who is20 years younger and she does all the shopping but I go with her in order to be out and active. I give her input into the groceries she buys, menus she shops for and freshness of products. I also have digestion problems which she refers to while shopping to get the things I would like and can eat. This way I can sit when she is talking to someone or sit when I cannot keep up with her and she can go on without worrying about me. This little seat is perfect for any walker. My 78 yr old Mom has Rheumatoid arthritis and can't use the walkers with built in seats because it is hard for her to squeeze the hand brakes, so she feels more comfortable using her standard walker. It is terrific to use when we go shopping anywhere. It can work as a comfortable seat, or to carry bulky items such as a laundry-bag or a shipping box. It is just a little too long, so I need to be careful that it doesn't hit walls or furniture. I assume that is because walkers can be different widths to accommodate most users. It can be a useful shelf for, say, a tray of food at a cafeteria-style restaurant. All in all, I think it's a good value. was going to sit on, BUT it is too heavy to haul around. This does fit on the one I own when seat to low and bar hits you in the back. Can't find it to hard to get up. Gave it to a friend who can use each walker is different. It works, but not as "slick" as we had hoped from the write up in the catalog. Probably O.K. for light person. Very well made. Unfortunately, seat "wood" is really particle board, which will collapse with higher humidity in southern climes or bathroom use and storage.. Mine collapsed in two, so I bought a replacement board (Oak) and remade it. NOW it's strong. Should have been manufactured with real wood, not particle board, which is weak in humidity. Walter Drake refused return, saying I didn't have it break soon enough for their warranty to cover. Cannot use inhouse, just for on the go outside of house. The seat extends 2 inches more than the walker which makes it very difficult to get into the bathroom through the standard door. The board is too narrow for comfort. The velcro straps are made backward so they won't fasten. to provide a place for mother to sit, where ever she may be with her walker. I have a new walker for travel (with folding legs) but it lacks a seat which I need for resting. This isn't very lightweight, but it will serve its purpose until a more tech-advanced accessory seat can be invented. To sit and rest during long walks. Need to sit while weeding & watering outside. To give my Mother a way to rest when needed during a walk. She has 3 walkers and wants this stuff for one of them. I have a surgery coming up that will require using my walker. The last time I used it I really missed having somewhere to sit. I'm hoping this will solve my problem. 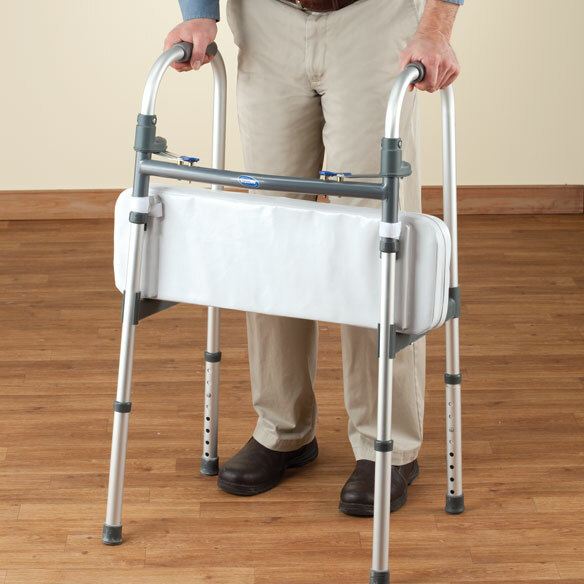 To aid person with limited walking mobility to rest when using walker. Right now, I am in a walker to get around. It will be helpful to me if I can use your product to sit down periodically. "This is for my 93 yr. old mother." Reccommended by PT/OT so she can rest on her way to dining room in her independent senior living. So my mother can rest her feet on it and keep her walker nearby. I have extreme difficulty getting up from normal chair height. There is a walker that is the right height but it cost $100. This seems like a better solution. I can't wait to use it. I chose this product for my Mother. My wife uses a walker and the seat will give the opportunity sit and the wheels will help direct the walker better. My 85 year-old father recently started using a walker and my mother wanted him to have a place to sit no matter where he went. for a walker user who prefers the lighter aluminum frame. Get a seat for walker. 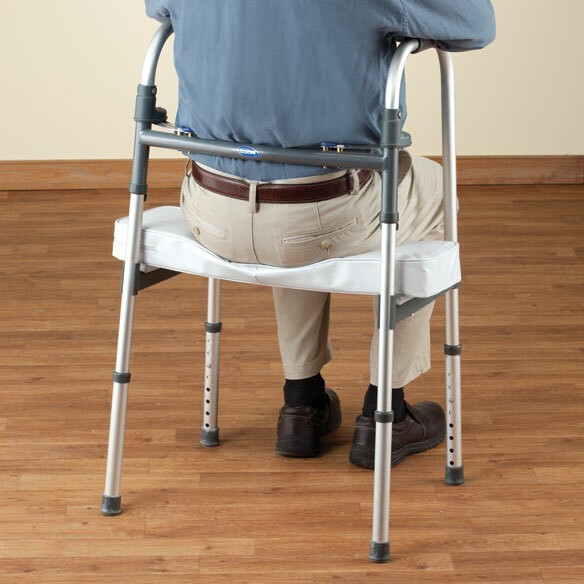 To assist with sitting and kneeling while using walker. Want to see if will work when doing activities where I need to kneel such as standing while doing dishes. currently have a walker w/out seat. Because you can rest on this set just as you would be able to rest on a seat of a rolator. My son needed a walker resting seat, to allow him to rest when he needs to. My sister has a "junior" walker to fit through the bathroom door. would this fit that? What is the actual weight of the seat? BEST ANSWER: Thank you for your question. It weighs 4 pounds. We hope this information will be of help to you. BEST ANSWER: Thank you for your question. The Walker Rest Seat weighs 4.96 lbs. We hope this information will be of help to you. does it take pressure off of your tailbone? BEST ANSWER: Thank you for your question. We do not have that information. We hope this information will be of help to you. does walker fold up with cushion on it?ow much does it weigh? BEST ANSWER: Thank you for your question. Yes the walker is fold able and weighs 4.96 pounds. We hope this information will be of help to you. Does this seat fit to use with the Drive Walker 10226-1 on Amazon ? BEST ANSWER: I got one of those to use on the standard walker I was provided after a stroke (see picture above). It is too long, so it sticks out beyond the width of the walker, and it slides back and forth on the walker bars. You can't lock it into place. This makes it hard to get through any narrow space, such as a doorway. You have to take the seat off to actually use the walker. I don't recommend this seat. I beleive it is the right length but I have not measured it. Overview states walker seat flips down when needed & out of way when not in use. How does seat flip down when needed? Do you have to move seat manually with the Velcro hook straps? Where exactly do the Velcro straps need to be placed on walker to move it from seat position to up position? BEST ANSWER: Thank you for your question. The seat is held in place with hook and loop closures. You will need to undo the straps each time you would like to fold up the seat. We hope this information will be of help to you. BEST ANSWER: Thank you for your question. The seat supports up to 250 lbs. We hope this information will be of help to you. my weight is 50lbs more, do you have a seat to support me? BEST ANSWER: Thank you for your question. This supports up to 250 lbs. We hope this information will be of help to you. my guardian walker has tubular vertical and horizontal rails. will this rest seat fit my walker? BEST ANSWER: Thank you for your question. It must have a bar that is straight. We hope this information will be of help to you.